Baking is one of my favourite things to do. Whenever I have free time I do it as much as I can and I love it. 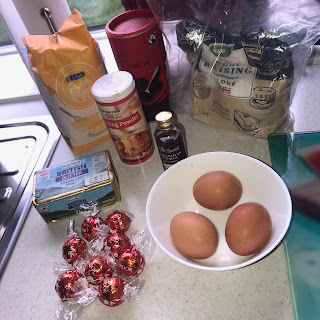 I want to make more baking blogposts but I honestly get so caught up in the excitement I forget! But I remembered this time and wanted to share it with you guys. What a better time than a bank holiday to bake too. I really love bank holidays because I always do things with my family so I though an extra post would be perfect to go up now! 3. Than I add the eggs, baking powder & vanilla extract. 4. To bind it all together I add the flour gradually and a dash of milk if it’s too think. 8. 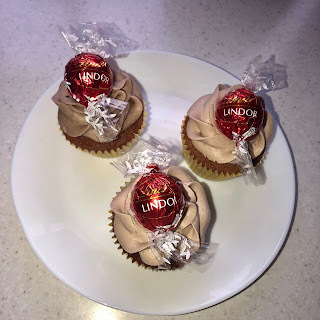 Using a piping bag & nozzle (wiltons 2D) frost the icing onto the cupcakes & add the Lindt chocolate on top! These honestly tastes amazing! I’m so happy with how they went because I didn’t expect them to go this well! I hope someone makes these & enjoys these because all my family loves them! These look delicious! Lindt chocolate is the BEST chocolate out there, and I can only imagine combining it with cake makes it extra good. These cupcakes look amazing! Just looking at the pictures I feel hungry!